Scientists that study birds are called ornithologists. The Kiwi of New Zealand is the only wingless bird. The world’s smallest egg belongs to a hummingbird. The worlds largest egg belongs to an ostrich. Some birds that don’t fly are penguins, ostriches and dodo birds. The only bird that can fly backwards are hummingbirds. The bird that can run the fastest are called ostriches. The smallest bird in North America is the Calliope Humming bird which on average is three inches. The heaviest bird in North America is called the Trumpeter Swan and weighs an average 40 or more pounds. There is about 10,000 known species in the world. Over 400 of those species are endangered. The only bird that can fly backward is a humming bird. Chickens cannot swallow upside down. The eyes of an ostrich are larger than their brain. There are over 350 species of parrots worldwide. Chickens are the most common bird on the planet. You can tell the type of diet of a bird by the shape of the beak. The most yolks ever found in a single egg is nine. Air sacs of a bird take up one- fifth of its body. Peacocks lay on average three to five eggs. Male Hummingbirds are usually smaller than females. The only wingless bird in the world is New Zealand’s Kiwi. The Archaeopteryx litographica was the earliest known bird and existed 150 million years ago. Birds do not have teeth but instead use their bills for chewing. A bird’s bones are hollow which help it to fly. About every ten minutes a humming bird eats. 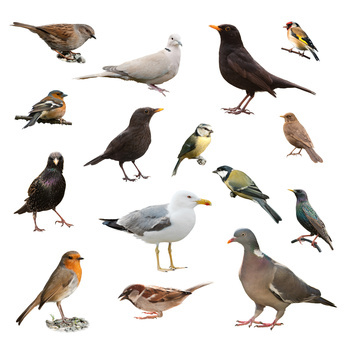 There are over thirty birds mentioned in the Bible. Whenever bats leave their cave they always turn left. A Hummingbird can hear better than humans. The average peacock weighs thirteen pounds. Birds today do not have any teeth. Birds have a tongue but also has a bone in it. A majority of bids are insectivores, which means they eat insects. Barn Owls have the best sense of hearing. The bird with the most amount of feathers is the Tundra Swan bird with 25,216 feathers. The bird with the least amount of feathers is the Ruby- throated Hummingbird with 940 feathers. There are over 1000 species of bats. On an average bats live over twenty years. Seventy-five percent of birds die before they are six month old. Flamingos get their pink coat because most of their diets consist of shrimp. The average peacock lives about twenty years. There are more chickens on earth than there are people. On average chickens run nine miles an hour.